The National Archives Catalog has reached a milestone: we now have 95% of our holdings completely described at the series level in our online catalog. This is a monumental achievement. Why? Because the National Archives holds over 14 billion pages of records, and we are adding hundreds of millions of pages to that total every year. Describing our records in the online Catalog means that the information for all of those holdings is in one central place for researchers anywhere to search and browse, and is vital to our strategic goal to Make Access Happen. Description enables us to provide the archival context of records as they are shared and re-used by researchers, citizen developers, and the public. We’ve come a long way since our first online catalog was released in 2001. By 2003, only 19% of our holdings were described online for the public to view. This means that without coming to an archives facility or contacting reference staff, the public could only be aware of 19% of our records. We know how difficult this made archival research. Describing our records also ensures that our archival holdings fit into an archival hierarchy. At the highest level of that hierarchy are Record Groups and Collections, and beneath those are Series. 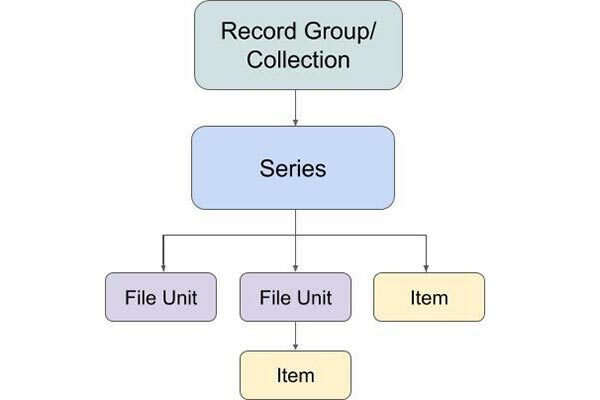 Beneath Series are more granular description levels – File Units and Items. When we say we have 95% of our holdings described, we mean at the Series level. For example, the series Photographs of American Military Activities, ca. 1918 – ca. 1981 consists of photographs documenting American activity, the bulk of which is military, from 1918 to 1981. You can see the robust level of description in this series identifying the hierarchy of records, dates, finding aid information, as well as scope and content notes. From this series description, you will also find a link to the items and digital objects in this series that are also currently described in the catalog. By reaching 95% series description, we have improved the ability for the public to be aware of and access our records. The credit for describing our records goes to the over 500 archival staff at National Archives locations across the country. These locations include 13 Presidential Libraries, the Center for Legislative Archives, and 20 other archival units from our Washington, DC-area and regional facilities. The hard work and archival expertise of these staff were indispensable to the effort to describe to 95%, and we would not be here without them! Thank you all for your hard work and for your public service describing the primary sources for America’s history. Just because we’ve reached 95% doesn’t mean our work is done. Our holdings continue to grow each year as we constantly receive new records. Our plan for the foreseeable future is to maintain 95% described as our overall holdings continue to grow, while working to add more lower level descriptions as well. To do this, archivists will continue to actively describe our remaining records, and will complete descriptions as new records are accessioned. We are committed to continuing to provide online access to as many of our records as we possibly can. Description of the records of the National Archives is vital to our strategic goal to Make Access Happen. Without description, the public will not have enough information to access and make use of the records. 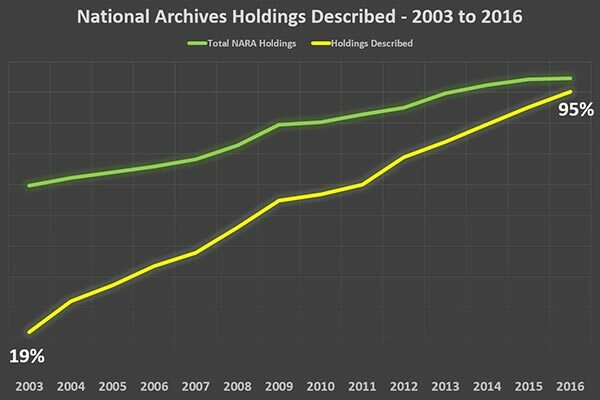 Fundamental to the archival profession, description shines a light on our holdings so the public can search and make use of the records of the National Archives, increasing transparency and accountability in our democracy._This post was originally published on the AOTUS blog.